Music at Paxton, a summer festival of top class international chamber music, takes place in Paxton House on the banks of the River Tweed in the Scottish Borders from 14 – 23 July 2017. 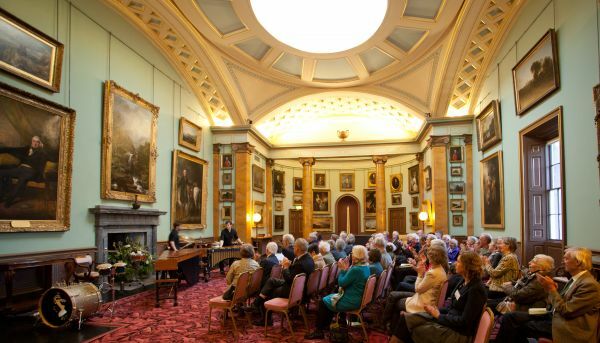 The daily concerts offer an intimate, friendly and relaxed experience and take place in Paxton House’s splendid Picture Gallery. With its large, domed roof-light that lets in the summer sun, and walls hung high with paintings from the National Galleries of Scotland’s collection, it is an idyllic setting for chamber music. The string quartet features prominently and the festival welcomes three this year: the Elias Quartet (Saturday 22 July, 7.30pm) who make their Paxton debut with two pillars of the chamber music repertoire Schubert’s String Quartet in D minor ‘Death and the Maiden’ and Schumann’s Piano Quintet; the Carducci Quartet (Saturday 15 July, 7.30pm) with a programme of Shostakovich, Arvo Pärt, Philip Glass, and Ravel’s gloriously sunny Introduction and Allegro; and the Quatuor Zaïde from Paris, (Tuesday 18 July, 7.30pm) who open with the glittering sonorities of Debussy, followed by Schubert’s towering G major Quartet. Harpsichord virtuoso Mahan Esfahani returns to Music at Paxton with two recitals this year. Renowned for his championing of the instrument, from the Baroque to the 20th century, Mahan Esfahani’s morning concert features music by Rameau, Martinů, and Swiss composer Pieter Mieg (Sunday 16 July, 11.30am). He returns that evening (Sunday 16 July, 6pm) to perform J S Bach’s Goldberg Variations. No stranger to Music at Paxton, pianist Steven Osborne (Friday 14 July, 7.30pm) performs his critically acclaimed interpretations of Rachmaninov’s virtuosic tonal studies Études Tableaux Op 33 and Études Tableaux Op 39 alongside Debussy and Brahms. Following his visit last year, the renowned cellist Pieter Wispelwey returns to complete the set of Suites for Solo Cello by J S Bach (Sunday 23 July, 6pm), with a public masterclass immediately beforehand (Sunday 23 July, 1.30pm). On Thursday 20 July at 7.30pm, Baroque violinist Bojan Cicic brings his star-studded Illyria Consort (Bojan Cicic violin and viola d'amore, Susanne Heinrich viola da gamba, David Miller theorbo and baroque guitar, and Steven Devine harpsichord) for a feast of Baroque music in this celebration of Handel and his London contemporaries including Handel, Carbonelli, Ariosti and Corbetta. Former BBC New Generation artist, soprano Ruby Hughes makes her debut at the Festival, performing Schubert, Schumann and Mahler, with pianist Joseph Middleton (Friday 21 July, 7.30pm). taking in some of Paxton House’s reception rooms and featuring music from Emma Wilkins (flute), Esther Swift (harp) and Calum Robertson (clarinet) (Saturday 15 July, 4pm). Aonach Mòr combines the talents of Claire Hastings, Grant McFarlane and Ron Jappy to create an exciting blend of songs and tunes (Sunday 16 July, 3.30 pm) featuring accordion, fiddle and guitar. Sirocco Winds, a brilliant young ensemble of current Masters students and graduates of the Royal Conservatoire of Scotland, perform Ligeti, Berio, Barber, Schifrin, Gershwin and Piazzolla (Wednesday 19 July, 7.30pm). Young Milan born guitarist and composer Marco Ramelli performs works from Spain and South America (Saturday 22 July, 4pm) in the intimate surroundings of the Dining Room at Paxton House and Benjamin Frith brings a lyrical programme of Scarlatti, Mendelssohn, Chopin and Stanford, designed for a relaxing hour on a Sunday morning (Sunday 23 July, 11.30am). Once again, in conjunction with Live Music Now Scotland and Paxton House, the extremely successful free one-hour taster concerts ‘Music at Paxton…Plus’ return to the festival. On Sunday 14 May at 2.30pm, guitarist Marco Ramelli performs works by Tarrega, Albéniz and Paganin and Calum Robertson (clarinet) and Juliette Philogene (piano) join forces on Sunday 4 June at 2.30pm for a programme of Jean Françaix, George Gershwin and Edward Gregson. Music at Paxton offers Sunday morning keyboard recitals, varied afternoon events including folk music in the marquee, two intimate recitals in the Dining Room, and a musical tour exploring some of the principal reception rooms of the 18th century neo-Palladian mansion.